On 11 November 1918, an armistice was signed between the Allies and Germany, and the guns fell silent on the Western Front. Armistice Day has been commemorated in New Zealand ever since, not only to celebrate peace but also to acknowledge the sacrifices of those who made peace possible. The depth of this sacrifice is exemplified by the experience of one small town, Manurewa. At the outbreak of the First World War, there were about 500 people living in the area. Few if any of them were to remain unaffected by the war. 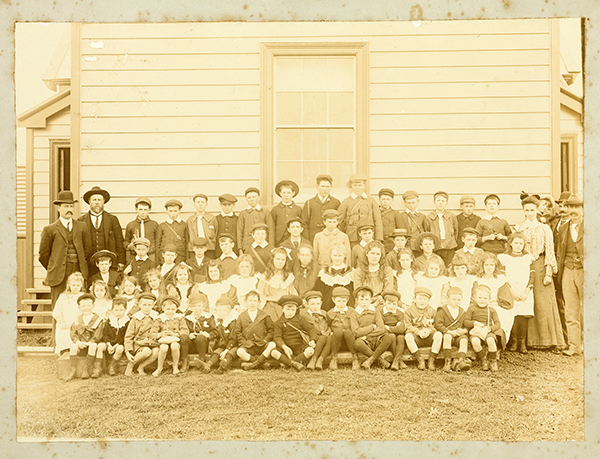 The photograph below was proudly taken on the opening day of Manurewa School, 3 September 1906. Little could it be imagined at the time that in less than a decade the ranks of the children assembled here would be significantly thinned by bullets, bayonets, sickness and bombs. Future soldiers, Manurewa, 1906. Auckland Libraries Heritage Collections, Footprints 05367. Photograph reproduced courtesy of Manurewa Historical Society. Seven of the older boys in the back row would see active service during the First World War: Walter Burton (fourth from left), Bert Ralls (sixth from left), Ted Mills (eighth), George Coxhead (tenth), Walter Costar (eleventh), Henry Lupton (thirteenth) and Bert McAnnally (last boy in the row). In the second row the future soldiers are Sam Craig (third from left), Douglas Wood (fourth), Cecil Slight (seventh), Jack Freshney (ninth), Laurie Mills (tenth) and Fred Lupton (eleventh). Even one of the younger boys in the front row, Bert Mills (tenth from left), saw active service. Walter Costar, Bert McAnnally, Cecil Slight and Douglas Wood would all be killed or die of wounds during the war. Reginald Costar, who was absent from school on the day of the photograph, would also die from wounds. Of the others, Bert Ralls was both wounded and gassed; Ted Mills was wounded twice and invalided home after an accident; Henry Lupton was wounded twice; Jack Freshney was wounded twice - and on the second occasion awarded the Military Medal; Laurie Mills, like his brother, was wounded at least twice. Only Walter Burton, who served in the Medical Corps, George Coxhead and Fred Lupton, who both arrived in Europe towards the end of the war, escaped unscathed; as did Samuel Craig, even though he saw action on the Somme and in New Zealand’s last battle of the war, at Le Quesnoy. A total of 184 men and one woman (Nurse Marjorie Harrowell) are listed on the various First World War memorials and rolls of honour in Manurewa and vicinity, of whom 176 are identifiable today. Of these, at least 167 served overseas. In the latter group, 49 men were killed in action or died of wounds, three died of diseases contracted during service, 320 were wounded severely enough to be declared unfit for further service, 34 were invalided out of service because of sickness and 27 were otherwise wounded or fell sick (some several times). Three were taken prisoners of war. Including sickness, this represents a casualty rate of more than 85%. Even for those who survived the suffering wasn’t over: one man with shell-shock was institutionalised for life; several men died accidentally not long after the war; and it was common for Manurewa’s ex-soldiers to die during their 40s or 50s. With such a roll call of sacrifice, it is perhaps invidious to single out any individual soldier. But perhaps the best known of Manurewa’s soldiers was the laconic but courageous Walter Costar. ‘Pte. Walt. R. Costar’. 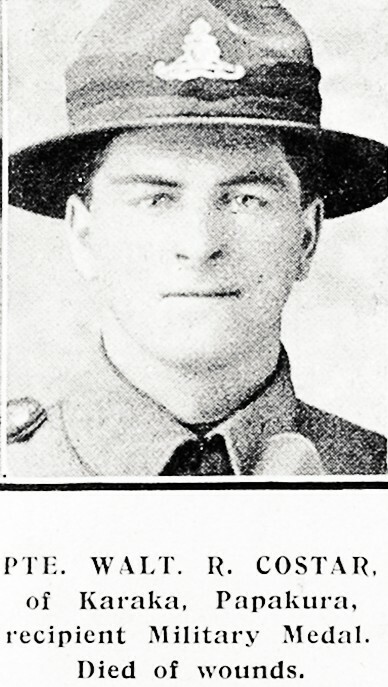 A portrait of Private Walter Reginald Costar (2/2600) published in the Auckland Weekly News, 7 February 1917, p. 37. Auckland Libraries Heritage Collections, AWNS-19180207-37-35. Costar, whose family had connections with both Manurewa and Karaka, enlisted in October 1915. A fitter by trade, he trained as an artilleryman, and was posted first to the 14th Battery then to the 11th Battery of the NZ Field Artillery in France. He was wounded twice before finally being killed in a bombardment on 5 December 1917. Not long before his death he had been awarded the Military Medal. His diary entry on that occasion read simply “Whole battery out of action. Received the Military Medal. Today has been dull and quiet.” The entry for the day of his death was equally terse: “Going into action again.” Walter’s younger brother, Reginald, also died of wounds received in action on 13 September 1918. 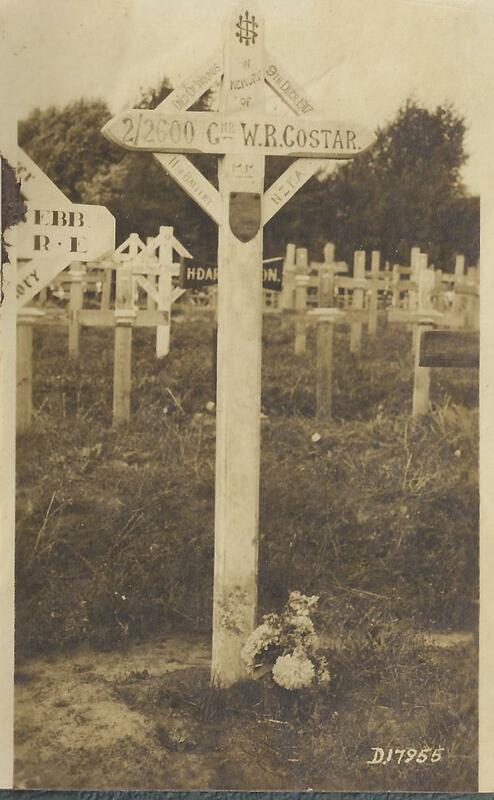 Temporary cross, Belgium, 1917. The temporary cross erected over Walter Costar’s grave at Lijssenthoek Military Cemetery, Belgium. (Photograph reproduced courtesy of the Costar family). The names of both Walter and Reginald Costar are recorded with those of 24 compatriots on the Manurewa war memorial obelisk, which was unveiled by Prime Minister W.F. Massey on the corner of Hill Road and Great South Road on 2 January 1921. They also appear, with many other names, on the Papakura-Karaka cenotaph and the Manurewa School, Wiri and Christ Church, Papakura, rolls of honour. 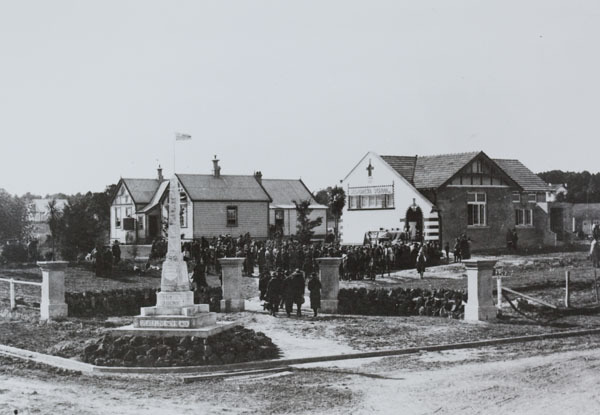 The Manurewa First World War memorial and school memorial gates, as seen on the opening day of the new Manurewa Infant School, 8 September 1921. Auckland Libraries Heritage Collections, Footprints 01220. Photograph reproduced courtesy of Manurewa Historical Society. 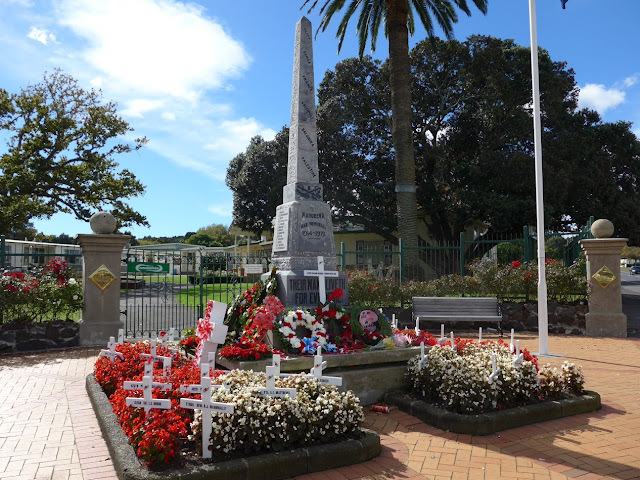 Manurewa First World War memorial, Anzac Day, 2015. (Photograph by Bruce Ringer). The above text has been extracted from an Armistice Day display prepared for the Manurewa Local Board and Manurewa Business Association. For more information, see Manurewa’s Soldiers: Manurewa During the First World War, 1914-1918 (Manurewa Returned Services Association, 2015).